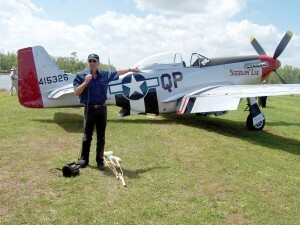 Kermit Weeks points to a two-place North American P-51 Mustang, “Sizzlin’ Liz,” that flew in for the Mustangs and Mustangs event at Fantasy of Flight. Fantasy of Flight and the Imperial Mustangs of Polk County hosted the Mustang Club of America’s National Show, “Mustangs and Mustangs—Legends Havin’ Fun,” April 8-10. 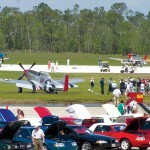 This is the only event that features both beautifully restored P-51 Mustang warbirds from WWII and Ford Mustang automobiles in the state of Florida annually. This is the first year that the show was held over three days. The aviation-themed attraction is in Polk City, Fla., halfway between Orlando and Tampa. 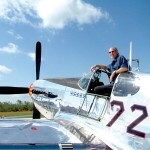 It takes visitors back to early flight, World War I, World War II and beyond. Kermit Weeks welcomes a large crowd at the Mustangs and Mustangs special event. 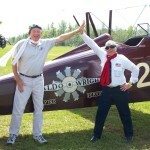 Bob Lock with Waldo Wright’s Flying Service gives a high five to Bill Stansbeary after their barnstorming flight in a recently restored 1929 New Standard D-25 biplane operated at the Fantasy of Flight during winter months. 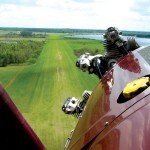 This rare view on approach to the grass runway at the World’s Greatest Aircraft Collection private airport shows the Wright J6-7 engine of a New Standard D-25 vintage aircraft.